Marshall Soult surveys the broken bridge as Oporto falls to the French on 29 March 1809. In the foreground a grenadier rescues an orphaned baby. Battle of Porto reenactment, in 2009. In the First Battle of Porto (28 March 1809) the French under Marshal Soult defeated the Portuguese, under General Parreiras, outside the city of Porto during the Peninsular War. Soult followed up his success by storming the city. It is estimated that 8,000 soldiers perished in the attack and that a great number of civilians were killed. After the Battle of Corunna, Napoleon ordered Marshal Nicolas Soult to invade Portugal from the north. He was to seize Porto by 1 February and Lisbon by 10 February. 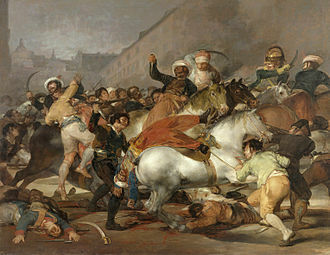 Napoleon failed to take into account both the wretched condition and the roads or the fact that a full-scale guerrilla war had broken out in Northern Portugal and Spain. Soult's II Corps had four infantry divisions, commanded by Generals of Division Pierre Hugues Victoire Merle, Julien Augustin Joseph Mermet, Étienne Heudelet de Bierre, and Henri François Delaborde. Merle had four battalions each of the 2nd Light, 4th Light and 15th Line Infantry Regiments and three battalions of the 36th Line. Mermet's division included four battalions each of the 31st Light, 47th Line, and 122nd Line, and one battalion each of the 3rd, 4th and 5th Swiss Regiments. Heudelet led two battalions each of the 22nd Line and 66th Line, one battalion each of the 15th Light, 32nd Light, 82nd Line, Légion du Midi, Paris Guard, and Hanoverian Legion. Delaborde's command comprised three battalions each of the 17th Light, 70th Line, and 86th Line. General of Division Jean Baptiste Marie Franceschi-Delonne led Soult's corps cavalry, the 1st Hussar, 8th Dragoon, 22nd Chasseur à Cheval, and Hanoverian Chasseur Regiments. Attached were General of Division Armand Lebrun de La Houssaye's 3rd Dragoon Division and General of Division Jean Thomas Guillaume Lorge's 4th Dragoon Division. The 3rd Dragoon Division was made up of the 17th, 18th, 19th and 27th Dragoon Regiments. The 4th Dragoon Division consisted of the 13th, 15th, 22nd and 25th Dragoon Regiments. In all, Soult had 23,500 men, including 3,100 cavalry. Soult's first attempt to invade Portugal was stopped by the local militia on 16 February. The French then moved northeast to Ourense in Spain, seized an unguarded bridge and marched south. On the way, Franceschi's cavalry overran Major General Nicolas Mahy's Spanish brigade at La Trepa on March 6, inflicting 700 casualties. The French crossed into Portugal and occupied Chaves on 9 March. From Chaves, Soult moved west to Póvoa de Lanhoso where he was confronted by Baron Christian Adolph Friedrich von Eben's 25,000-man army composed mostly of Portuguese militia armed with muskets, pikes, and agricultural implements. 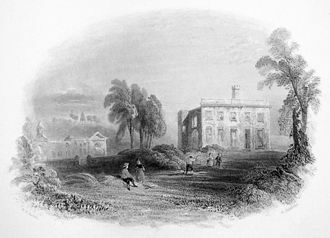 After waiting several days for all his troops to arrive, Soult went over to the attack. On 20 March 1809 in the Battle of Braga the French veterans butchered their adversaries. The outmatched Portuguese lost 4,000 killed and 400 captured. The French, who lost 40 killed and 160 wounded, also seized 17 Portuguese cannons. Bishop Castro organized an army of 24,000 men to defend Porto. 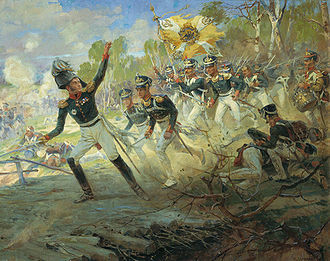 Generals Lima and Parreiras commanded two battalions, each of the 6th, 18th and 21st Infantry Regiments, and one battalion of the 9th and other units. The 4,500 Portuguese regulars were supported by 10,000 ordenanças (militia) and 9,000 armed citizens. When Soult hurled Merle, Mermet, Heudelet, Franceschi and Lahoussaye at the Portuguese deployed north of the city, on the weakest part of the Portuguese line of defence, Castro's force soon dissolved and the battle became a massacre. 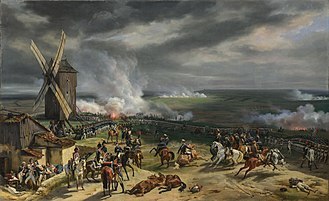 The Portuguese tried to escape from the French in the city but were chased by the French cavalry throughout the streets, and their regular units were annihilated. Thousands of fleeing civilians drowned when a bridge of boats across the Douro River (as soon as some Portuguese units started to sabotage the bridge to prevent the French from crossing the river) collapsed because of their weight and of Portuguese artillery fire (coming from the left side of the Douro) who were aiming at the French cavalry behind the Portuguese soldiers and citizens. In the roadstead, Soult captured a squadron of Spanish naval vessels and 30 merchant ships. The French also found large stockpiles of British military stores. 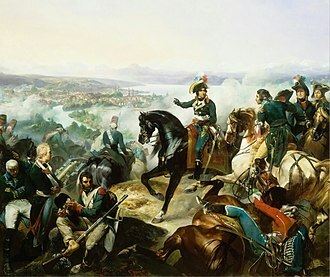 In the battle and storming of the city, the French lost 72 officers and 2,000 rank and file casualties. The Portuguese lost about 8,000 killed and 197 cannons captured. Soult did not have very long to enjoy his success. Almost at once, the ordenanças cut his communications with Spain and a 1,800-man garrison was gobbled up by Francisco Silveira's Portuguese force in the Siege of Chaves. The French marshal started planning a retreat. 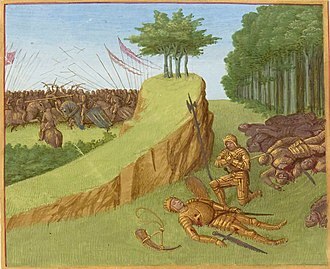 The next action was the Battle of Grijó. 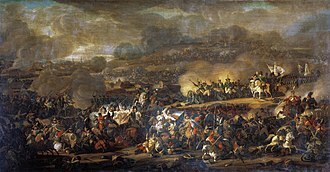 The city was retaken on 12 May by the British and Portuguese under Wellesley in the Second Battle of Porto. ^ Porto has traditionally been called Oporto in English. Glover, Michael, The Peninsular War 1807-1814 Penguin, 1974. 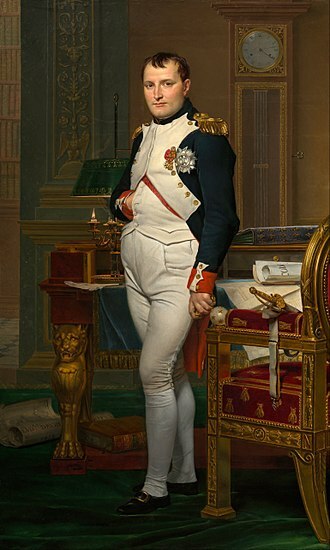 Nicolas Jean-de-Dieu Soult, 1st Duke of Dalmatia, was a French general and statesman, named Marshal of the Empire in 1804 and often called Marshal Soult. Soult was one of six officers in French history to receive the distinction of Marshal General of France. The Duke served three times as President of the Council of Ministers, or Prime Minister of France. Soults intrigues while occupying Portugal earned him the nickname, King Nicolas, one historian called him a plunderer in the world class. Soult was born at Saint-Amans-la-Bastide and named after John of God and he was the son of a country notary named Jean Soult by his marriage to Brigitte de Grenier. His paternal grandparents were Jean Soult and Jeanne de Calvet, while his grandparents were Pierre François de Grenier de Lapierre. His younger brother Pierre became a French general, Soults superior education ensured his promotion to the rank of sergeant after six years service, and in July 1791 he became instructor to the first battalion of volunteers of the Bas-Rhin. He was serving in this battalion in 1792, after the Battle of Fleurus of 1794, in which he distinguished himself for coolness, he was promoted to brigadier general by the representatives on mission. For the next five years Soult was employed in Germany under Jourdan, Moreau, Kléber and Lefebvre, and in 1799 he was promoted general of division and ordered to proceed to Switzerland. It was at time that he laid the foundations of his military fame, he particularly distinguished himself in Massénas great Swiss campaign. He accompanied Masséna to Genoa, and acted as his principal lieutenant throughout the siege of that city. He was wounded and taken prisoner at Monte Cretto on 13 April 1800, the victory of Marengo restored his freedom, and Soult received the command of the southern part of the kingdom of Naples. In 1802 he was appointed one of the four generals commanding the consular guard. 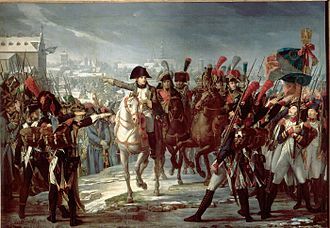 Though he was one of those generals who had served under Moreau, in consequence he was appointed in August 1803 as the commander-in-chief of the camp of Boulogne, and in May 1804 he was made one of the first marshals of the Empire. Porto is the second largest city in Portugal after Lisbon and one of the major urban areas of the Iberian Peninsula. The urban area of Porto, which extends beyond the limits of the city, has a population of 2.1 million in an area of 389 km2. It is recognized as a global city by the Globalization and World Cities Study Group. Located along the Douro river estuary in Northern Portugal, Porto is one of the oldest European centres, the western part of its urban area extends to the coastline of the Atlantic Ocean. Its settlement dates back centuries, when it was an outpost of the Roman Empire. Its combined Celtic-Latin name, Portus Cale, has referred to as the origin of the name Portugal, based on transliteration. In Portuguese, the name of the city is spelled with a definite article, its English name evolved from a misinterpretation of the oral pronunciation and referred to as Oporto in modern literature and by many speakers. In 2014 and 2017, Porto was elected The Best European Destination by the Best European Destinations Agency, the history of Porto dates back to around 300 BC with Proto-Celtic and Celtic people being the first known inhabitants. Ruins of that period have been discovered in several areas, during the Roman occupation of the Iberian Peninsula the city developed as an important commercial port, primarily in the trade between Olissipona and Bracara Augusta. Porto fell under the control of the Moors during the invasion of the Iberian Peninsula in 711. In 868, Vímara Peres, a warlord from Gallaecia, and this included the area from the Minho to the Douro River, the settlement of Portus Cale and the area that is known as Vila Nova de Gaia. 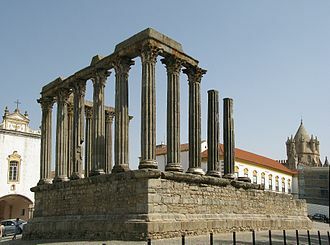 Portus Cale, referred to as Portucale, was the origin for the name of Portugal. In 868, Count Vímara Peres established the County of Portugal, or, in 1387, Porto was the site of the marriage of John I of Portugal and Philippa of Lancaster, daughter of John of Gaunt, this symbolized a long-standing military alliance between Portugal and England. The Portuguese-English alliance, is the worlds oldest recorded military alliance, in the 14th and the 15th centuries, Portos shipyards contributed to the development of Portuguese shipbuilding. Divisional general is a rank of general in command of a division. Examples would include the Spanish general de división, the French général de division, for convenience such ranks are often translated into English as major-general, the equivalent rank used by most English-speaking nations. The corresponding NATO code is OF-7, or a two-star rank, some countries of Latin America such as Brazil and Chile use divisional general as the equivalent of lieutenant-general. This corresponding NATO code is OF-8, or a rank for these countries. In Japan and Taiwan the rank of lieutenant-general is equivalent to divisional general, the rank is mostly used in countries where it is used as a modern alternative to a previous older rank of major-general. The rank is almost always above a rank corresponding to command of a brigade, a French Army général de division translates as a general of division. The French Air Force equivalent is général de division aérienne, rank insignia is that of 3 white stars on the epaulette, sleeve mark or shoulder board. As well as commanding a division, a général de division may be appointed as général de corps darmée commanding a corps, or as a général darmée. These are not ranks, but appointments of the same rank, the insignia of a général de corps darmée is four stars in a diamond formation, and that of a général darmée is five stars in a cross-shaped arrangement. The arrangement for the air force is the same, but the ranks are called général de corps darmée aérien, the Italian army and Carabineer rank of generale di divisione translates as divisional general. The air force equivalent is generale di divisione aerea, the Polish equivalent is generał dywizji. The symbols of rank are the generals wavy line and two stars, featured both on the rogatywka, on the sleeves of the uniform and above the breast pocket of a field uniform. The Brazilian rank general-de-divisão translates literally as general of division, and is used by the army and this rank is equivalent to lieutenant-general. The air force equivalent is major-brigadeiro. Ourense is a city in northwestern Spain, the capital of the province of the same name in Galicia. Its population of 106,905 accounts for 30% of the population of the province, in 2010 there were 5,943 foreigners living in the city, representing 5. 46% of the total population. The main nationalities are Portuguese and Brazilians, by language, according to 2008 data, 19% of the population speak always in Galician, 25% speak always in Spanish and the rest use both interchangeably. 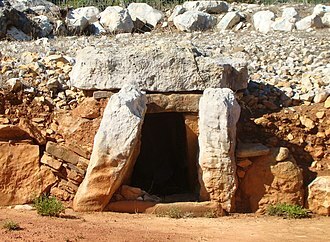 The origin of the town can be traced to the Romans and these can still be seen today. There was the need to fortify the place to one of the easiest ways to cross the Miño River. After the Romans, Ourense was part of the Suebi kingdom during most of the 5th, 6th and 7th centuries and was destroyed by the Moors in 716 and it was rebuilt by Alfonso III of Asturias about 877. 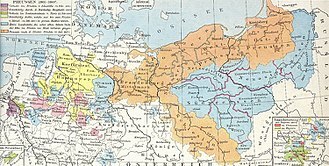 The Norse invasions as well as attacks from the Arab warlord Al-Mansur once more laid the city to waste and it was only under Sancho II and his sister Doña Elvira that the city was resettled during 11th century. The definitive urban impulse did not arrive until the 12th century when Ourense became an important center of services, recently the city has made many efforts to provide new parks, bridges and geothermal springs installations to make the city more attractive. The ancient city of Auria is located on banks of the Minho River in the south-central part of Galicia, at an elevation of 128 m above sea level. Four rivers cross the town, Miño, Barbaña, Loña, the biggest river divides a rather industrial western suburb, which contains the railroad station, from the main town. Three highway and one railroad bridge cross the river in addition to the famous Roman bridge, Ponte Vella, the town is surrounded by forests, mainly oak and pine. One of the main tourist attractions is related to hot springs, there are several places called pozas, with or without entrance fee, where you can have a bath outdoors. 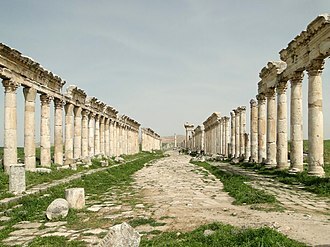 One of them is located inside the old town, relating to the ancient Roman tradition, summers have hot daytime temperatures around 30 °C, whilst winters are wet with daytime highs at 12 °C and lows a few degrees above freezing. 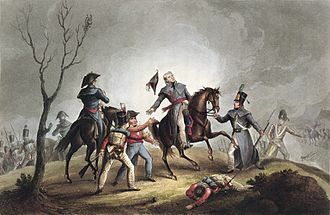 The Battle of Corunna took place on 16 January 1809, when a French corps under Marshal of the Empire Nicolas Jean de Dieu Soult attacked a British army under Lieutenant-General Sir John Moore. 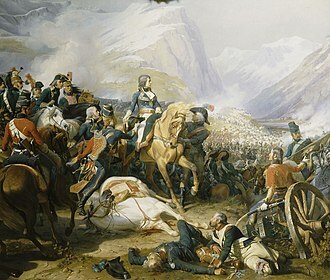 The battle took place amidst the Peninsular War, which was a part of the wider Napoleonic Wars, doggedly pursued by the French under Soult, the British made a retreat across northern Spain while their rearguard fought off repeated French attacks. Both armies suffered extremely from the winter conditions. 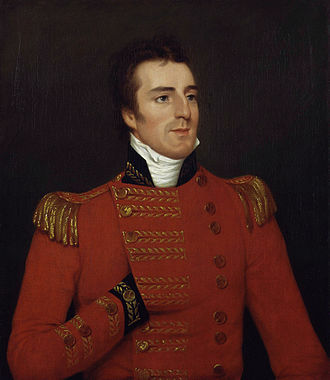 Much of the British army, excluding the elite Light Brigade under Robert Craufurd, suffered from a loss of order and discipline during the retreat. When the British eventually reached the port of Corunna on the northern coast of Galicia in Spain a few days ahead of the French they found their transport ships had not arrived. During the battle, Sir John Moore, the British commander, was mortally wounded, dying after hearing all the French attacks had been repulsed. In addition, Sir David Baird in command of an expedition of reinforcements out of Falmouth consisting of 150 transports carrying between 12,000 and 13,000 men, convoyed by H. M. S.
Louie and Champion, entered Corunna Harbour on the 13 October, by November 1808 the British army, led by Moore, advanced into Spain with orders to assist the Spanish armies in their struggle against the invading forces of Napoleon. 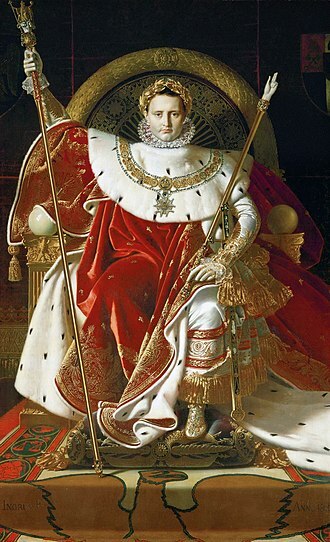 After the surrender of a French army corps at Bailén and the loss of Portugal Napoleon was convinced of the peril he faced in Spain, deeply disturbed by news of Sintra, the Emperor remarked, I see that everybody has lost their head since the infamous capitulation of Bailén. I realise that I must go there myself to get the machine working again, the French, all but masters of Spain in June, stood with their backs to the Pyrenees, clutching at Navarre and Catalonia. It was not known if even these two footholds could be maintained in the face of a Spanish attack, by October French strength in Spain, including garrisons, was about 75,000 soldiers. They were facing 86,000 Spanish troops with Spains 35,000 British allies en route, with the fall of the monarchy, constitutional power devolved to local juntas. The term, the diminutive form of war in Spanish, is usually translated as little war, and the word, has been used to refer to the concept since the 18th century, and perhaps earlier. In correct Spanish usage, a person who is a member of a guerrilla is a guerrillero if male, the term guerrilla was used in English as early as 1809, to refer to the fighters, and to denote a group or band of such fighters. However, in most languages guerrilla still denotes the style of warfare. The use of the diminutive evokes the differences in number, guerrillas usually carries positive connotations, and is often used by such fighters themselves and by their sympathizers, while their foes in many cases call them terrorists. Making an objective definition of the difference between a guerrilla and a terrorist has proven a difficult task, the strategy and tactics of guerrilla warfare tend to focus around the use of a small, mobile force competing against a larger, more unwieldy one. The Guerrilla focuses on organizing in small units, depending on the support of the local population, the guerrilla army would avoid any confrontation with large units of enemy troops, but seek and eliminate small groups of soldiers to minimize losses and exhaust the opposing force. Not limiting their targets to personnel, enemy resources are preferred targets. All of that is to weaken the strength, to cause the enemy eventually to be unable to prosecute the war any longer. It is often misunderstood that guerrilla warfare must involve disguising as civilians to cause enemy troops to fail in telling friend from foe, this is not a primary feature of a guerrilla war. This type of war can be practiced anywhere there are places for combatants to cover themselves, at least one author credits the ancient Chinese work The Art of War with providing instruction in such tactics to Mao. The Chinese general and strategist Sun Tzu, in his The Art of War or 600 BC to 501 BC, was the earliest to propose the use of guerrilla warfare and this directly inspired the development of modern guerrilla warfare. 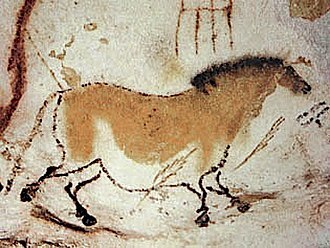 Guerrilla tactics were employed by prehistoric tribal warriors against enemy tribes. 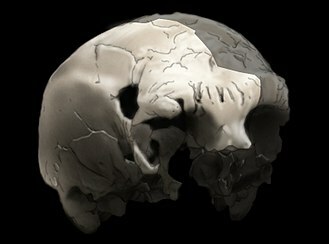 Evidence of conventional warfare, on the hand, did not emerge until 3100 BC in Egypt. 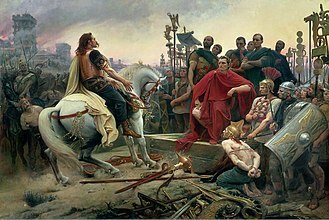 Since the Enlightenment, ideologies such as nationalism, socialism, because of the innovative tactics he used during his command, he made himself the name of Terror Romanorum. A counter-insurgency or counterinsurgency operation involves actions taken by the government of a nation to contain or quell an insurgency taken up against it.